— from THE MAN WHO SHOT LIBERTY VALANCE. Reprising his MAD MAX BEYOND THUNDERDOME hairdo, donning a slimming skort, pumping up the man-ceps and dropping an accent that is either Scottish or some form of Indonesian elvish, Mel Gibson brings the thunder as revolutionary Scotsman William Wallace, historical figure made mythical mantoy in BRAVEHEART. Scotland’s cucumbers are yours no more! Every man dies. Not every man truly lives to wear a skirt. Written by an actual descendant of the Scot warrior, Randall Wallace, and directed by Gibson’s massive arms, BRAVEHEART takes us to 1300’s Scotland, as Wallace, with his mullet set on stun, leads Scots and Irish forces to free Scotland from the stranglehold of English King Edward Longshanks (Edward I, played by Patrick McGoohan with delicious contempt). 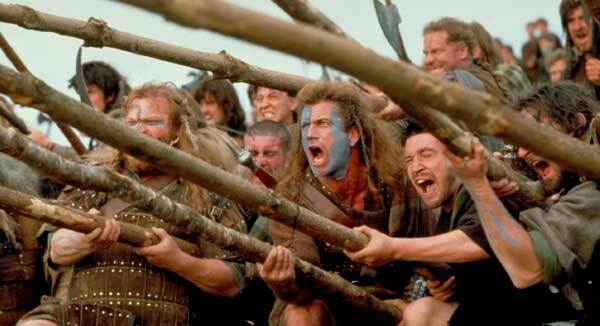 BRAVEHEART is one of the last great epic battle films, if not the last, to use actual people in crowded combat rather than computer blips – the battle scenes are some of the best you will ever see for choreography, editing, kineticism, brutality – yet the movie does not shirk on sterling characters, nuanced acting chops, moral ambiguity, political treachery, heart-aching romance, and a soundtrack by James Horner to match its majestic sweep. 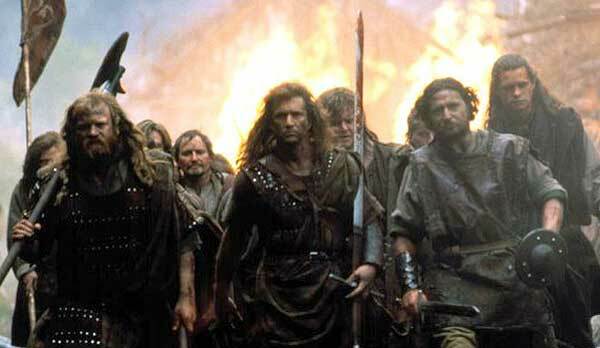 BRAVEHEART is truly Mel’s masterwork, all legend, extra cheese, thundering hooves, swampy castles, weak-chested nobles and iron-thewed warriors covered in layers of kilt and poo. Mel is not so much worried about recreating history as recreating the way the light slopes off his muddied deltoids. Returning to his village after being raised by his uncle (Brian Cox, looking like a rugged Billy Connolly), Wallace finds his beloved homeland cringing under the iron fist of English garrisons, who are given the right by King Edward Longshanks to prima nocte – the “first night” with new brides married in their jurisdiction. Edward considers it “Scotland, my land!” and hopes to “breed the Scots out” by ordering prima nocte. He tells his court, “The trouble with Scotland – is that it’s full of Scots.” McGoohan owns the trigger-tempered Longshanks, whose delivery is hilarious in its haughtiness. Wallace avoids political squabbles, yet the antagonism of the resident English garrison forces his hand to war when they kill his secretly-married bride, Murron (Catherine McCormack). In a berserker rage Wallace decimates the garrison almost singlehandedly in a hand-to-hand battle which presages the lethal beauty to come – ruthless, wide-eyed and vicious, his vengeance palpable, his kinsmen following his lead; impact weapons, mallets, maces, clawed spears, and Wallace kicking the garrison commander against a pole and slitting his throat as emotionlessly as the commander slit Murron’s. The English retaliate. It’s on! Wallace, who just wanted to raise crops peacefully, finds himself leading Scotland in repelling England from their beloved rolling lands, then taking the battle to England herself by invading York and beheading its prince, to quell Longshanks’s ambitions at their source. for there were no new arses left to paint blue. The great Brendan Gleeson is Wallace’s best friend, Hamish; rugged James Cosmo is Hamish’s father and unstoppable battlehound, Campbell; Sean McGinley is Murron’s glowering father; Angus Macfadyen is suitably regal and simultaneously limp-principled as nobleman Robert the Bruce, with a crazed recluse father who looks like Gerard Depardieu in leper makeup – Robert will be Wallace’s Judas; an eccentric performance by David O’Hara as Stephen the Irish loon; Tommy Flanagan is the wronged husband of a prima nocte wife. Ahem – But how about them battle scenes, eh?! Aye, fight and you may die. Run, and you’ll live, at least a while. And dying in your beds, many years from now, would you be willing to trade all the days, from this day to that, for one chance – just one chance – to come back here and tell our enemies that they may take our lives, but they’ll never take – our FREEDOM! And all while painted blue. We are there, as the English armored horse canter toward the kilted Scottish battle formations; we smell the wet grass underhoof, we sense the pounding thunder as they close in bent on massacre; as tree-spears lie at our feet – a surprise attack in full view – Wallace calls, “Hold!… hold!… hold!…” (“The smell of acrid smoke and horses’ breath / As we plunge on into certain death” – The Trooper, Iron Maiden) And just before the equine tsunami breaks upon us in banshee ululation – we raise the tree-spears. Into horse flesh. And all Mel breaks loose. Inventing the Slow Walk Away From Explosion, 1300’s represent! 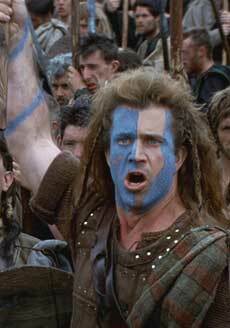 BRAVEHEART is not a historical document, and doing the research will only muddle the truth about William Wallace all the more. Rather, Randall Wallace and Mel Gibson have crafted a stylistic juggernaut tribute to a man who heavily affected Scotland’s history. And if we are to believe this film, he also sowed his seed with princess Isabelle, so he affected England’s history as well. And it’s an incredibly brave performance by Mel, considering he can’t do a Scottish accent. Wallace is brought down by betrayal, and his execution cry is – “FREEDOM!” But the concept of personal freedom was alien to peoples who were inculcated to believe their royalty was emplaced by gods. He might as well have shouted “DEMOCRACY!” – another concept as alien to the people of the times as democracy is to the American presidents who prop up dictators around the world and pretend like it’s the oppressed country’s fault that they don’t have democracy. He doesn’t mean US, does he? Starring: Mel Gibson, Patrick McGoohan, James Cosmo, Sean McGinley, Brian Cox, Peter Hanly, Sophie Marceau, Stephen Billington, Barry McGovern, Angus Macfadyen, Catherine McCormack, Brendan Gleeson, Tommy Flanagan, Peter Mullan, James Robinson.